Thermosyphons are passive heat transfer devices that operate on the simple process of convection through vaporization and condensation. Heat transfer will only occur when the low end of the unit is warmer that the high end. Ther refrigeration cycle is similar to that of mechanical refrigeration plant in that the refrigerant changes phase from liquid to vapour to liquid as it boils and condenses. The temperature differential across the thermosyphon drives the heat transfer like the compressor in a mechanical plant and the larger the temperture differential the higher the heat transfer rate. 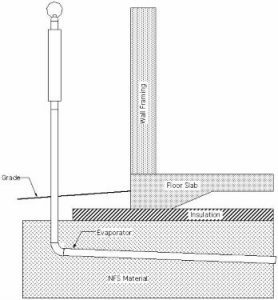 Sloping Evaporator Thermoprobes are found on the majority of existing passive subgrade cooling system installations beneath slab-on-grade structures. These units utilize a sloped evaporator to insure that the condensate will flow from the condenser to the lowest portion of the evaporator. Typically, evaporator slopes are between 10% and 3% – with the median being 5%.